The Nutri Ninja 2-in-1 helps you quickly prepare nutrient-rich super juices and healthy meals. Instantly flip to processing/blending mode in seconds! Nutrient & Vitamin Extraction* provides a new, better tasting, more nutritious kind of beverage. *Extract a drink containing vitamins and nutrients from fruits and vegetables. Quick and easy meal preparation, endless results! EXTRACT HIDDEN NUTRITION** FROM WHOLE FRUITS & VEGGIES - Break down fresh or frozen fruits, veggies, and ice into smooth, nutrient-rich beverages. Blend frozen smoothies or quickly prep food in seconds. Take it with you on the go; so fast and easy there's no excuse not to eat healthier and fresher. 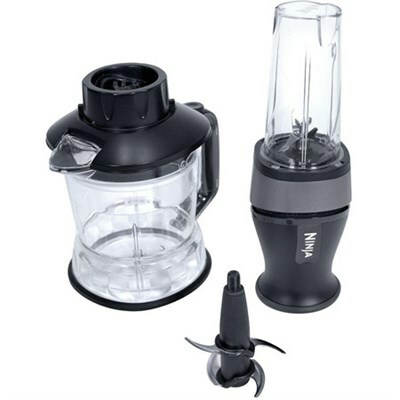 **By blending whole fruits and vegetables, including portions that are usually discarded. Chop, blend, grate, grind, make dough and mix - all in one bowl. Makes 1 lb of dough in 30 seconds. Crushes ice into snow for smooth frozen drinks and desserts. Chops evenly and consistently. The size of a coffee cup, the power pod will take up little space on the counter or in kitchen cabinets. Sleek and modern, the 2-in-1 provides 700 watts of power to blend frozen food and ice quickly. The sturdy food processor bowl is so light, easy to use and easy to clean, you'll want to use it every day. Nutri Ninja:reg; cups come with Sip & Seal lids and fit in most car cup holders. Replaces multiple appliances with one versatile solution! Quick and easy to assemble, use, clean, and store. Great for individuals, families, and entertaining!